You and me, Halifax. Tonight is the night. I will be speaking at 6:30pm sharp at the Hub Halifax presented by the kind folks of the GDC Atlantic. All topics will be covered, including art, design, toys, comics, drawing, inspiration, community and a whole lot more. This is the first time I will be speaking publicly in my home town. Lets make it count. I’ll also have new Signalnoise stickers on-hand for those who are attending. Lots of colour. Can’t wait. 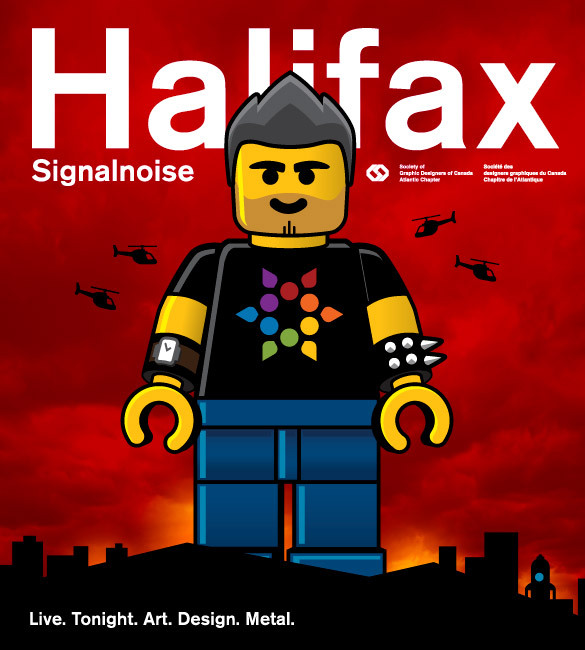 See you there, Halifax. Nice touch with the cityscape! New lego-trend…I like it….is there any lego-figure template or your creation? Ahaha! Best one yet, buddy! I was there! Thanks for a great talk. Listening to someone who has done fun and exciting things and who enjoys doing it was a definite pickup. And a little Motley Crue never hurt anyone.